How will assessing employees make my organization more competitive? Will using assessments increase our legal risk? Can we customize your assessments to reflect our unique culture? What types of assessments do you offer? Are your assessments scientifically valid and reliable? 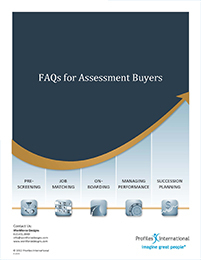 How do I administer assessments in my organization? How will assessing my employees help me get to the next level? What type of pre-hire assessments do you offer? Do your assessments really predict success? Will your assessments help me achieve my sales objectives? How will assessing employees help me reduce turnover? Can assessments really improve our ability to deliver great customer service? If your question isn’t answered in the FAQs, please contact us for an answer. Download a comprehensive list of FAQs organized by four key job functions.